Being able to read drum sheet music has been one of the greatest assets in my drumming career so far! Seriously, it doesn’t matter whether I walked into the rehearsal room of a new band or joined an orchestra. Once they saw that I could sit down in front of a piece of paper (and a drum set of course) and just start playing with them – they were impressed. And I’m not saying that in order to brag. Rather, I want to motivate you to learn to read drum sheet music too. For drummers who can’t are a dime and a dozen. And once you can, this will make it so much easier for you to be picked by a band – or whatever formation you want to join – instead of begging to be considered. So without further ado, let’s jump in: I’ll take you from absolute zero to reading a fairly complex four-bar phrase in the first half of the article. It’s not difficult but somewhat technical – so please bear with me. 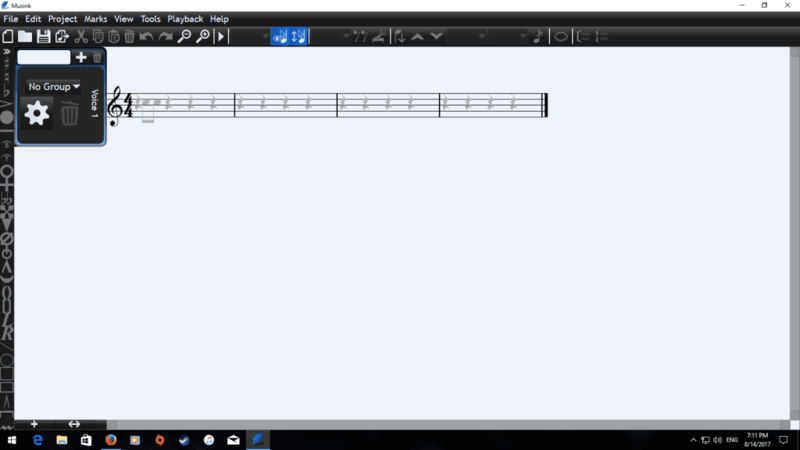 And because you can impress even more (or earn money) by being able to writ drum sheet music yourself – I’ll throw in some tips on that in the second half of the article – including my favorite free drum sheet music software. Let’s first look at where each drum or cymbal sits on the staff. That the hi-hat and the ride cymbal sit on the same line. Always play the hi-hat unless stated otherwise. The easiest way to remember / make sense of these positions is to recognize that the height of a note in the 5-line system approximates to where you play the associated drum / cymbal. For instance: You play the bass drum and hi-hat foot with – guess what- your feet so they are furthest down in the staff. By contrast, the cymbals are situated up above your drums (and much higher than your pedals), so they are placed highest in the staff. So know you know which cymbal or drum a certain piece of sheet music tells you to play. But how do you know when to play it? It will be placed at the very beginning of each piece of drum sheet music and you can safely ignore the number at the bottom for now. Rather, focus on the number at the top which tells you how many notes can fit into a bar (i.e. a part of your sheet; more on that in a second…). Jep. But what about this “bar” thing? Well, 4 notes for an entire piece of music wouldn’t be cool. It would give about 0.1 to 4 seconds of music (if you made it awfully slow). But fitting in, say, 400 instead of 4 notes wouldn’t be helpful either, because unless you’re an advanced musician, you need to count notes to be able to follow along. And you’d certainly lose track when trying to count to 400 and to play drums at the same time. This way you can fit 400 notes into a piece of sheet music – giving you minutes and minutes of music – while only having to count to 4, because now the sequence of 400 notes would be broken into 100 bars containing 4 notes each. So you have your piece of drum sheet music in front of you and you’re counting “1, 2, 3, 4”? Cool! But what to actually play while counting? This is what notes tell you. 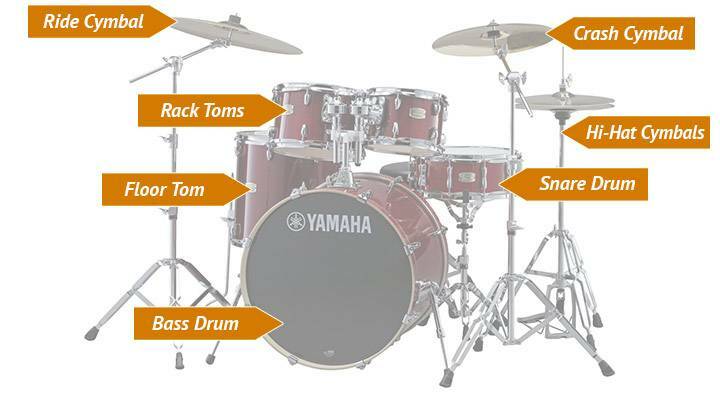 The most important ones are listed below and in order to read drum sheet music you need to be able to distinguish them by the way they appear in the “note” section (circle filled or unfilled; with or without vertical line; with or without tail). But: don’t try to learn them by heart now; rather, come back later once you encounter problems in your actual reading of drum sheet music. Playing a “whole” note, you’d hit a drum (or a cymbal) on count “1” and then wait for 3 more beats (i.e. the “2”, “3” and “4”) so you’d have covered four beats in total. Playing a “half” note, you’d hit on count “1”, wait out count “2”. If there was another “half” note after that, you’d hit again on “3” and wait out “4”. “1, 2, 3, 4” and a hit on each of those counts – that’s all there is to it. An eighth note, by contrast, only lasts half a beat, so half of each of your counts. You’d hit on “1” and the eighth note would end exactly mid-way between counts “1” and “2”. But how to determine the exact middle between two counts? Well, by way of a more finely-grained counting system. Instead of “1, 2, 3, 4”, we’d now count “1, and, 2, and, 3, and, 4, and”. And hitting on count “1”, we’d now that the eighth lasts exactly until our first “and”. “1, e, and, a, 2, e, and, a, 3, e, and, a, 4, e, and, a”. Hitting on count “1”, you’d know that one sixteenth note would exactly last until count “e”. And how many sixteenth notes will fill up a whole bar? The final step is to take the information about note values and combine it with your knowledge about note placement from the beginning of the article (that tells you which drum / cymbal to play). and one (down below) to be played on the bass drum. Now let’s focus on the hi-hat part and its note values to find out how we’d have to count and play. In this case, the hi-hat is notated in eighth notes so you’d have to count and play in “1, and, 2, and, 3, and, 4, and”. Now that you can count and play the hi-hat you’d move on to the the second drum part in the middle (for the snare drum). And since we’ve already written out the counting pattern, we immediately see that the snare is played two times in this bar: once on count “2” and once on count “4”. Easy enough right? Moving on to the bass drum part at the bottom, it’s equally simple. You’d have to hit the kick pedal on counts “1”, “3” as well as on the “and” following “3”. And the cool thing is: once you’ve understood the system so far, you’ll be to figure out how to read another rock groove on this planet too. If you’ve figured out that this fill in consists of 16th notes you’re exactly right. And we’ve got sixteen of those – a whole a bar, that is. Here is a video of the fill being played (jump to 4:02 of the video). This four-bar phrase might seem intimidating, when actually it isn’t. Because looking closer, you’ll realize that the first 3 bars are exactly the same. So figure out 25% and be able to play 75%. That’s a pretty sweet deal – and it’s actually very common in drumming. I estimate that on average 50-75% of the bars of any drum sheet consist of the same pattern played over and over again. You do this – of course – by focusing on the hi-hat part at the top which is – yet again – counted and played in eighth. The second part, for the snare drum, is played – yet again – on counts “2” and “4” and the new thing here is an additional hit on the “and” after count “4”. The bass drum part (at the bottom) might seem strange to you and that is because it contains a “rest” – the small thing on count 3 – which we haven’t covered yet. 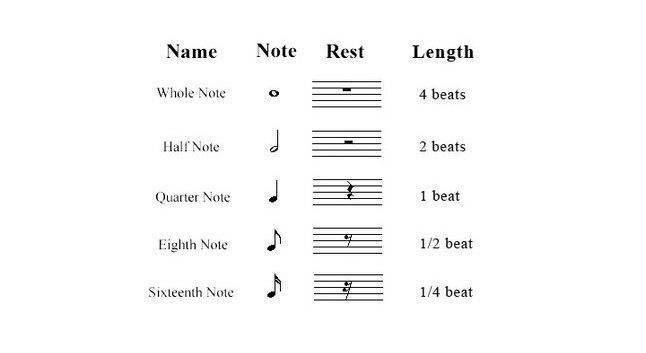 Now, rests are the opposite of notes. and, as the name suggests, rests tell you when decidedly not to play. Focusing on the bass drum part, there are obviously lots of moments in the bar where you don’t play, so actually the author could have put in many more rests. For some reason he didn’t, but that need not concern us. The only thing that you should note is that the symbol on count “3” tells you not to play anything, so you’re left with 2 hits on the bass drum in this bar: on count “1” and count “and” after “3”. And now something a little new: two parts played simultaneously on count “4” – the bass drum and the crash cymbal. And there you have it. In a few dozen minutes you’ve gone from zero to reading a complex four-bar phrase. So imagine what you could do with a little practice like this every now and then? I promised to also throw in some tips on writing drum sheet music. This comes in especially handy when you join an existing band and are forced to learn dozens of songs that are new for you in a short amount of time. For chances are you won’t be able to learn them all by heart until the first rehearsal. So I always write out drum charts for the songs and bring them along for the first few rehearsals. This way, I don’t have to worry about what to play and can focus on playing it well – and it usually earns me the respect of my new band mates, since not many drummers know how to write down their sh**. 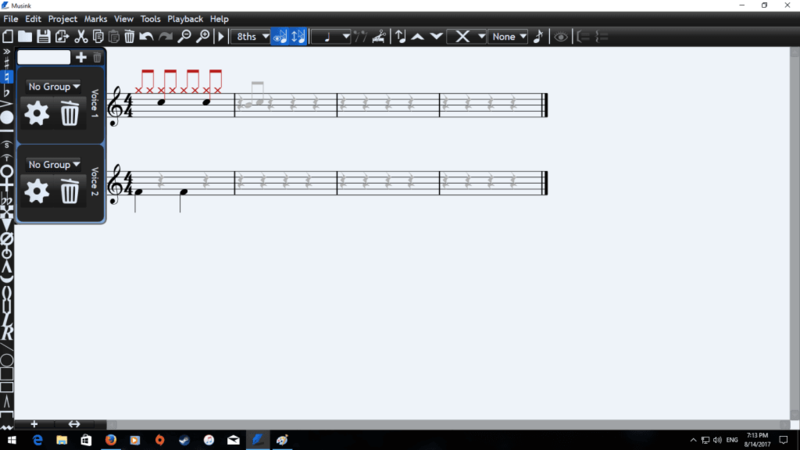 I use a notation program called Musink to write out all my drum parts. And the best part: it’s free and easy to use! And here is a YouTube tutorial on how to write drum notation in Musink. I hope you’re now well on your way to reading and writing drum sheet music. In case you have any questions, just drop me a comment below! I reply to each and every one of them! Another great, immediately usable article. Thanks. Thanks, Luke, I appreciate it! Thanks a lot – I appreciate it! If you have any more questions, just drop me a comment again. I’ve been playing for over 25 years and have always been intimidated by reading. This really helped with understanding it. Thank you! Thank you very much Peter! I’m happy I could be of help! I know almost nothing about sheet music, but…. When you say “That’s why sheet music writers came up with the idea of bars (or “measures”) which are signified by a horizontal line like this:” do you mean vertical line? Just wondering if I’m missing something. Thanks. Really appreciate the hint, thanks! Are you able to write the music just by listening to a recording? For sure, Sue. Why are you asking? My son learnt ‘come as you are’ nirvana by ear for gcse music. School now want sheet music to go with it. Iv ordered the nirvana drum book and its different to what he has learnt. Only problem is i need it for monday. Sorry for only getting back to you now. I was on a weekend trip and only saw this now – and I fear it’s a little late now. Is he supposed to perform the song during the exam? Let me know if I can still be of any help! He knows it without the music so i guess he could hand the music in later. It turns out no one has to write it up after all: I found the full sheet for the song over here. I’ve checked it and think it is a good one. Hope it helps your son. All the best for his exam! Thanks for that, I cant even get the song right. Its smells like teen spirit. The problem he has he can play most of it but cant play the chorus. I can’t really help with getting him to play the chorus from afar, though. Does he have a drum teacher? Can you turn to him / her? Otherwise, this tutorial might help. Hi, I know I’m really late to this article. But, I’m a young and inspiring drummer and, this was a lot of help. Thank you and i will be back! My pleasure! All the best for your drumming journey! Great info posted I basically already at this point of reading the music sheets .. but reading the way that you explain it seem to sink in little farther great job. Yes, that’s a tricky one! Perhaps you can try out both by counting them while the song is playing and then accentuating the “1” – by clapping or other means. This should help you figure out whether this accent fits the music or not. Note positions on the staff align with the physical location of the drum/cymbal? It is – but I didn’t invent this off course 🙂 Thanks Michael! You are awesome! Is there a site you recommend to find sheet music? I am learning how to play and started a new band with another fellow music noob and am trying to learn “You’ve Got it All Wrong” by the Hives. Thanks, man! I like this one for sheet music. I couldn’t find “You’ve Got It All Wrong” at a quick search myself – but perhaps you’ll have more luck. I do think this will help me thank you. That’s awesome, Beryl! Thanks for the feedback! Do you know any sheet music for Panic! At The Disco? I can’t find any. Oh and by the way this article was super helpful so thank you for that. I only found “This Is Gospel” but in the form of a video of the score – which I find a refreshing idea. Hello! I am just starting out as a winger / songwriter that wants to record her own beats. One of the first songs with an easy-sounding drum part I’d like to cover is “I’m Set Free” by the Velvet Underground. Obviously the tempo and quality of the drums on that recording is a mess, and the drum kit sounds so lo-fi that it is hard to tell where Maureen is hitting the kick drum etc. Would you know where a drum transcription exists for this? Very grateful for your website. Thank you for providing this educational material!!!! Thanks so much for your kind words. I haven’t been able to find that particular song transcribed online – but on these guys over here write out custom drum sheets, so perhaps they’d be able to help you out. Thanks for your kind words. Looking forward to seeing you back here! Have you written other articles on sheet music? Thanks for your feedback! So far I haven’t, but perhaps I should…Do you have any particular question with respect to sheet music? I need info and recommendation on how to master sheet music for drums. Do you know Any book or site that would help? Perhaps this video can lead you into the right direction. There are various symbols for pauses, depending on how long the author of the sheet intended them to be. See the image just beneath the sentence “But: don’t try to learn them by heart now; rather, come back later once you encounter problems in your actual reading of drum sheet music.” above. Thanks Yannick you’re a star! I’m a beginner and any help I can get is always welcome…every day’s a school day for me like! I’m getting the basics now and my rudiments are come along but it’s good to learn new disciplines in parallel to try and reinforce any method of learning….if you get my drift! Absolutely, Simon. That’s the spirit to go about learning the drums (or anything really). Keep it up and best of luck! I really love the sheet music lesson …wanna ask,is there no video for the last sheet? Thanks for your question, but I don’t follow. What do you mean by “last sheet”? Thank you so much for your feedback – and I’m glad I could help! All the best for you – and if you have any drumming-related questions, just let me know. 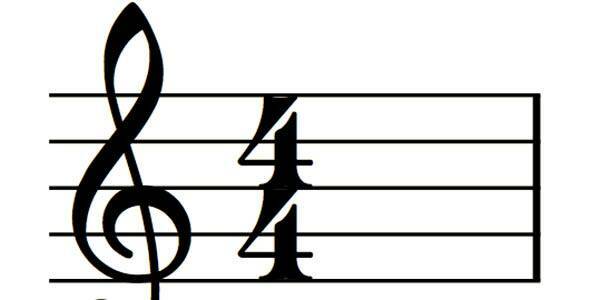 why is the first kick a quarter note and the second a 1/8? Thanks for your question! What part of the article are you referring to? Got it! I think you should think less about the notes and more about the count that they are played on. As such, the first note is a quarter note and supposed to be played on count “1” – whereas the second kick note is a 1/8 and supposed to be played on count “3+”. That’s great Azreal! I’m happy to help any time!